Poori is an Indian fried bread that is often served for breakfast with Chai tea or as a snack paired with jeera ki aloo (potato curry). My husband's late grandmother Baji used to make the best poori and I would eat them by the dozen (no joke!). There are two versions I learned from her, today I'm sharing the somewhat more complex, less healthy version made with white flour, coarsely ground wheat and yogurt. The preparation is fairly easy. The delicate part is the frying step that can be a bit tricky. 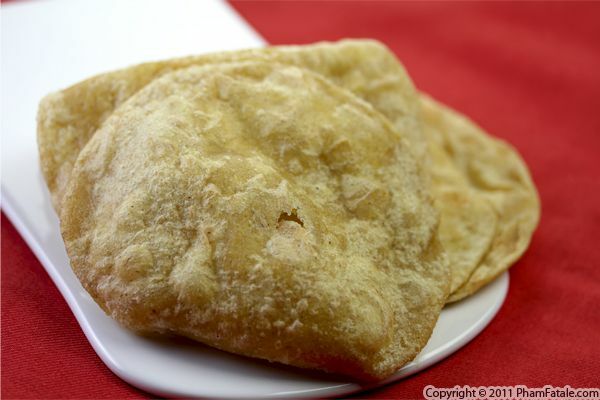 It took me a little practice to get soft, fluffy and less oily poori. As always, I haven't held back any secrets, so follow the instructions and you'll be enjoying delicious pooris in the comfort of your home! This recipe is for the ones who love the good old combination of peanut butter and banana, but with fewer calories. As I've said in the past, I always try to find ways to ensure that my husband Lulu, who is a vegetarian, has enough nutrition in his diet. He's also been exercising regularly lately, so I figured a healthy treat was in order. I made banana milk that is vegan (Lulu's lactose intolerant too!). 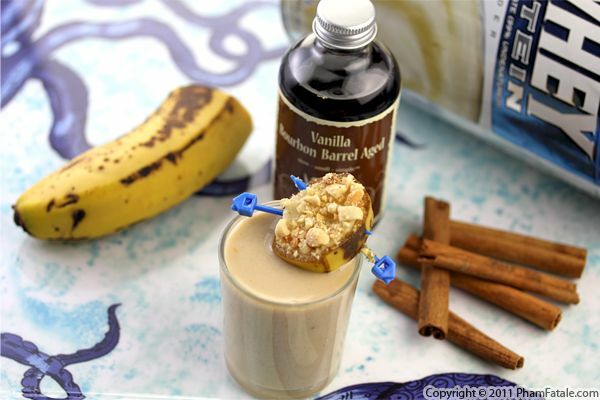 The drink is a blend of bananas, soy milk, peanut butter, cinnamon, whey protein and vanilla extract. It's a delicious way to start the day with healthy servings of potassium and protein, which is great for a vegetarian diet. Best of all, Lulu loves it! And if you like this drink, I'll post more whey protein-enhanced beverages soon. 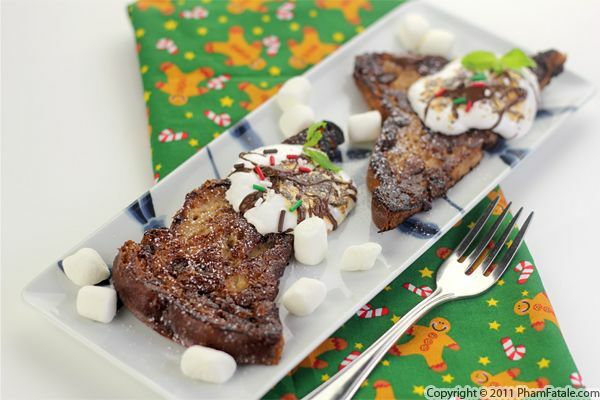 This special breakfast combines French toast, chocolate and, since it's the holidays, marshmallows. I took stale brioche, dipped it in chocolate flavored custard and seared it on the stove. The garnish is made with marshmallow fluff and a drizzle of warm Nutella. Who would say no to that? Speaking of chocolate, our friends from Romanicos are giving away $85 worth of their delicious handmade chocolates, called the “Cube Box”. I had an opportunity to try the chocolates recently, and they are honestly some of the best I’ve had in the US. I thought I could only get chocolates of this quality in France, so I was very pleasantly surprised. My husband’s family was literally fighting over them, so I’m going to have to get more soon! If you’d like to personalize the product for the holidays, check out Romanico’s Family Holiday Gifts. You can have your holiday greeting cards printed directly on the box. And of course, don’t forget to enter today’s giveaway for your chance to win! Make sure you're a fan of PhamFatale Facebook fan page and Romanicos Chocolate, or follow @Phamfatalecom and tweet about this giveaway. 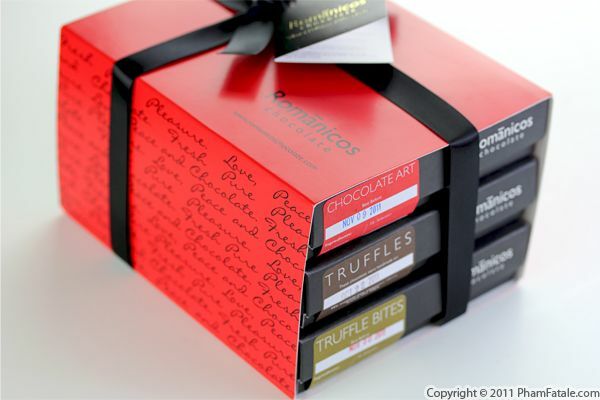 To make it easy, you can just copy and paste this tweet if you’d like: "$85 Romanicos Chocolate #Giveaway from @Phamfatalecom and @Romanicos_Choco: http://bit.ly/sp4V7y". 479° Popcorn is my favorite snack of the moment. 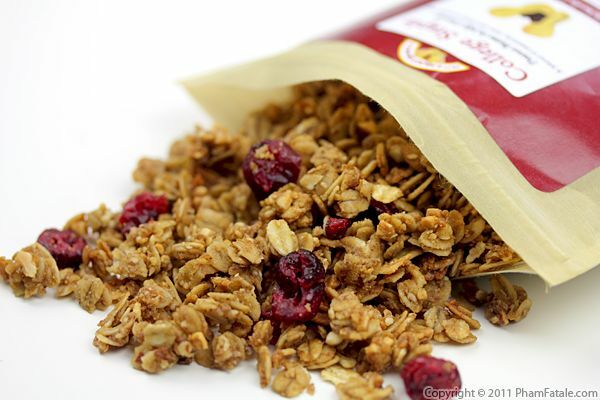 The packaging is fun and creative and needless to say this gourmet organic popcorn is awesome. I could finish an entire bag on my own. 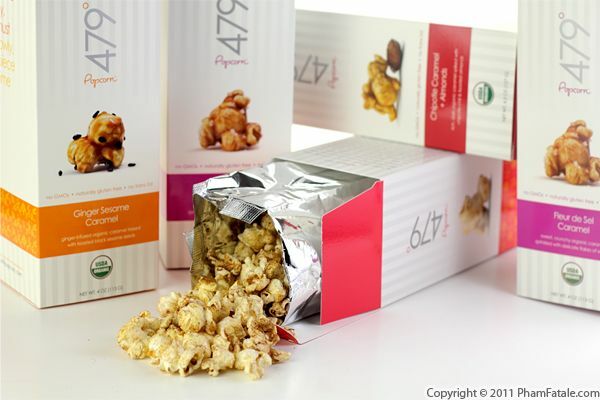 479° Popcorn is a San Francisco company that features a very interesting array of flavors such as Fleur de Sel Caramel, Alderwood Smoked Sea Salt, Black Truffle, Chipotle Caramel + Almonds, Ginger Sesame Caramel, Madras Curry Coconut + Cashews, Pimenton de la Vera and Vietnamese Cinnamon Sugar. The design is so original it makes the perfect holiday gift box. One of my husband's little sisters is obsessed with popcorn, and her birthday is coming up in a few weeks, so we're planning on buying her weight in 479° popcorn as a present. OK, that's a bit of an exaggeration! I love experimenting with just about anything, so I created marshmallow treats with their Vietnamese Cinnamon Sugar-flavored popcorn. I made a yogurt parfait and incorporated the sweet treats as a substitute for granola. This recipe is flavored according to the season; I used mandarin wedges and orange and cranberry sauce. You could adapt it with what you like of course. 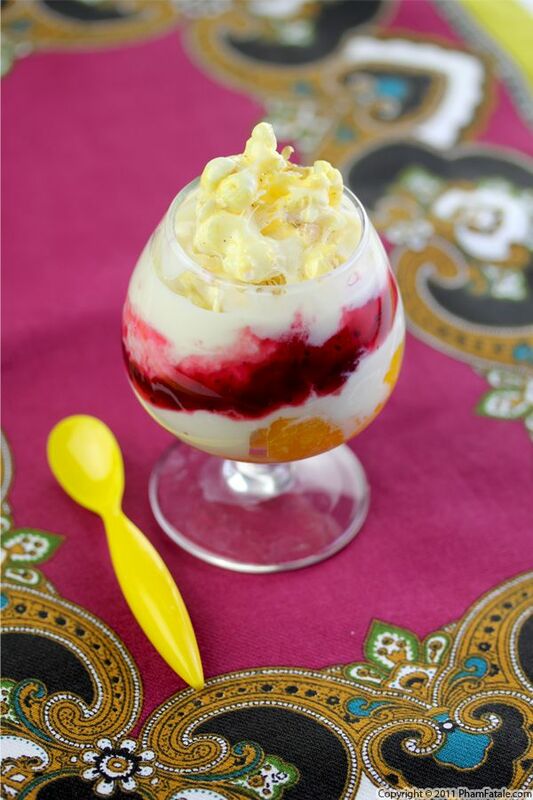 You don't have to create these cups for breakfast or dessert (or whenever you eat parfaits); just savoring 479° Popcorn by itself is perfectly reasonable. Make sure you're a fan of PhamFatale Facebook fan page and 479° Popcorn, or follow @Phamfatalecom and tweet about this giveaway. To make it easy, you can just copy and paste this tweet if you’d like: "Sweet Tooth Gift Pack #Giveaway from @Phamfatalecom and @479Popcorn: http://bit.ly/sp4V7y". Vietnamese Cinnamon Sugar flavored popcorn. Page 12 of 21 pages.